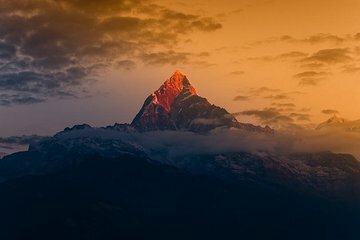 Pokhara, Nepals næststørste by, er omgivet af fantastiske naturattraktioner, men mange rejsende sover gennem den mest spektakulære attraktion: et solopgangsperspektiv over Annapurna-rækken. Under denne naturskønne morgentur til Sarangkot vil du være sikker på at få mest muligt ud af dit besøg på søbredden. Nyd en bekymringsfri præ-daggry afgang med din egen private guide, så behandle dig selv med en uforglemmelig wake-up. It's an early start and you have to be lucky to see the sunrise. I got lucky and had an amazing view early morning. Well worth the effort of getting up their. Very convenient to get up to Sarangkot and would highly recommend. Great view, though it gets very crowded and noisy at the top. I removed a star because I had no idea when I was going to get picked up and due to the holiday season, no one was available at the tour office to ask. The guide also insisted that I pay the entrance fee which I thought was included with this tour but I wasn't going to argue with someone 4am in the morning. He said that he wasn't told anything from the tour company. We were picked up on time by an excellent guide who took us to a rooftop viewing point which we had to ourselves. We didn't realise until we were leaving that most of the viewing points were very crowded. It was worth booking the tour for this alone.